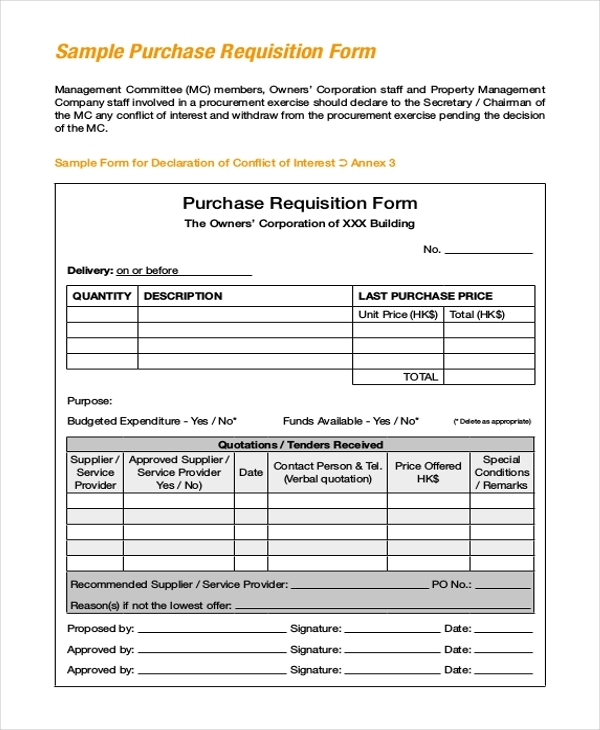 A purchase requisition form is a type of a legal document which is generated by an organization notifying the purchasing department about the items that is needed to order, the quantity and the time frame for the completion of the order. The form also has the authorization to proceed further with the purchasing activity. 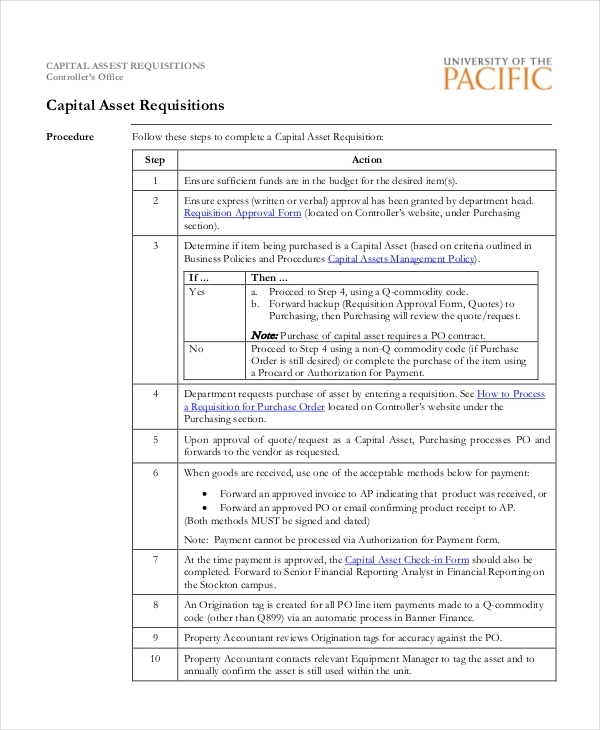 This particular form is used while purchasing an asset. Every organization needs to purchase various things for its working. All the elements that a company buys, become an asset to it. Henceforth, this form is used in order to fill the various details of the items needed to purchase. The form contains every detail of the items that an organization needs to buy. The details are filled like this; first comes the item no, quantity of the item and at the end the amount charged. At last it is sent to the accounts department for the final approval of purchasing. A blank requisition form is also used for getting approval for various items that are needed to be brought. In this particular form, there is a big row and column format where one can actually note down every item that is needed to be purchased. Along with the items, the quantity needed and price should also be mentioned. 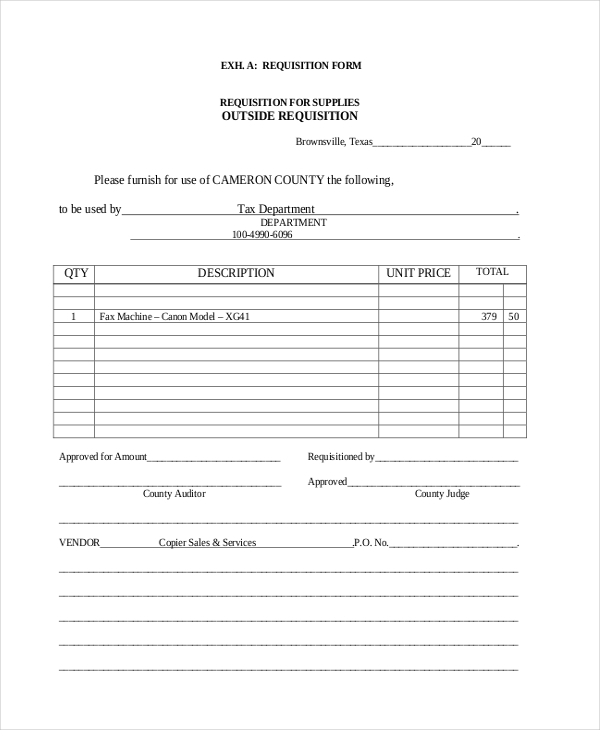 This particular form is used as a requisition statement for the various items needed to be purchased for a church. The north Henry Baptist Church uses this particular form for purchasing various items needed in the working of the church. After filling up the items and the other details, a single copy of the form is sent to the Finance ministry for the final approval. After the approval of the form, the purchase is made. 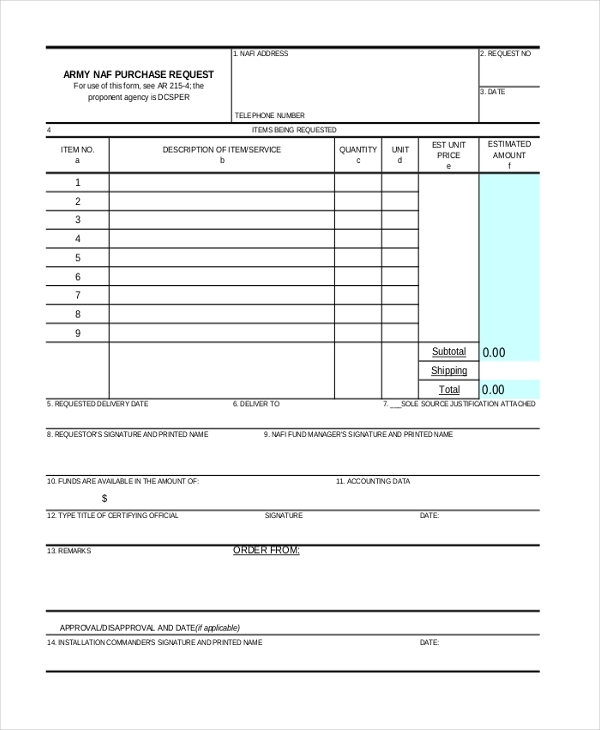 This form is used by an organization in buying various goods and items that are needed. 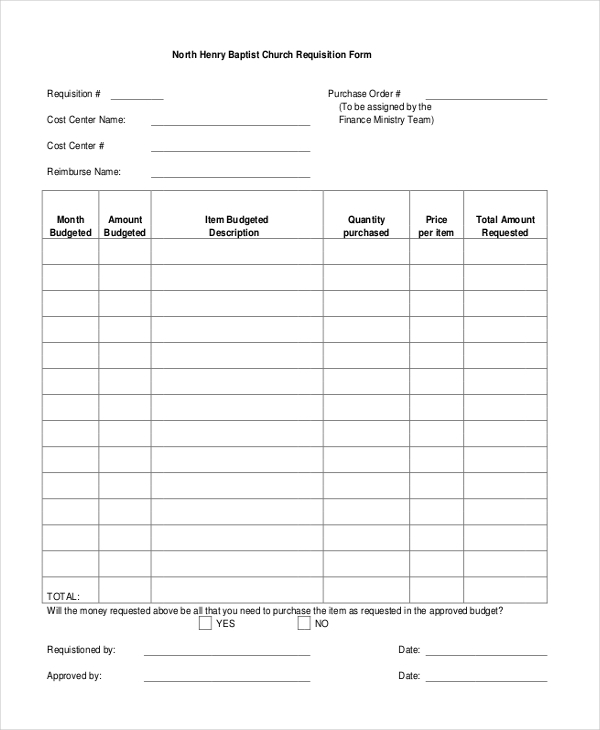 The employees of the organization or a particular purchasing department use this form as a requisition to purchase various essential items that are needed. After filling up the form, it is sent to the accounts department for the approval. When the accounts department approves the form, the company purchases the things that are needed. 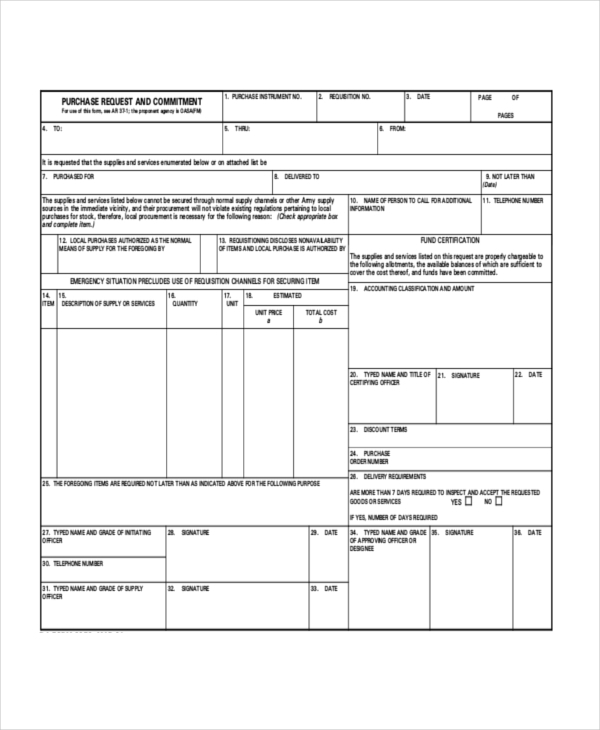 This form is used as a legal document for purchase requisition. 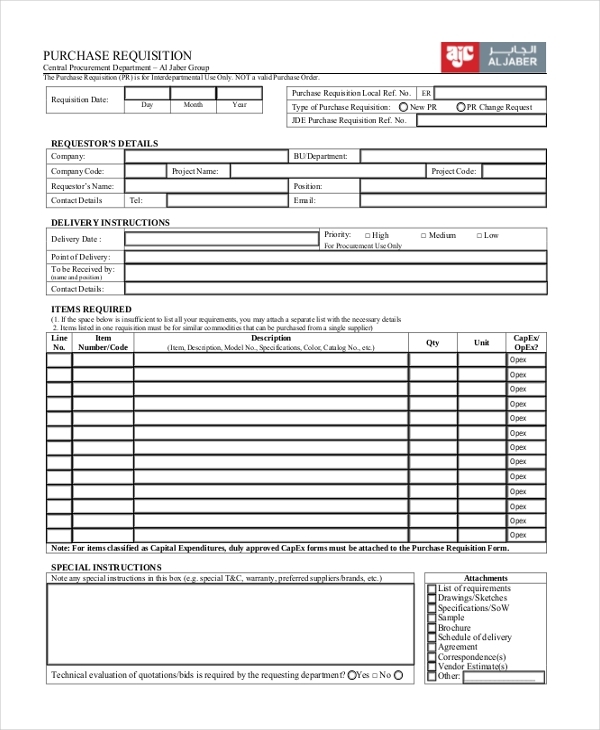 This form is used as a requisition document in buying electronic items. Various organizations need to buy electronic items for variable purposes. This form assists in the buying process. The members of the organization fills up the details of the electronic items that are needed like lights, air- conditioners, etc and then it is sent for the final approval. The form contains every details of the item, like the item no, description and the amount that will be needed in buying each and every particular product. 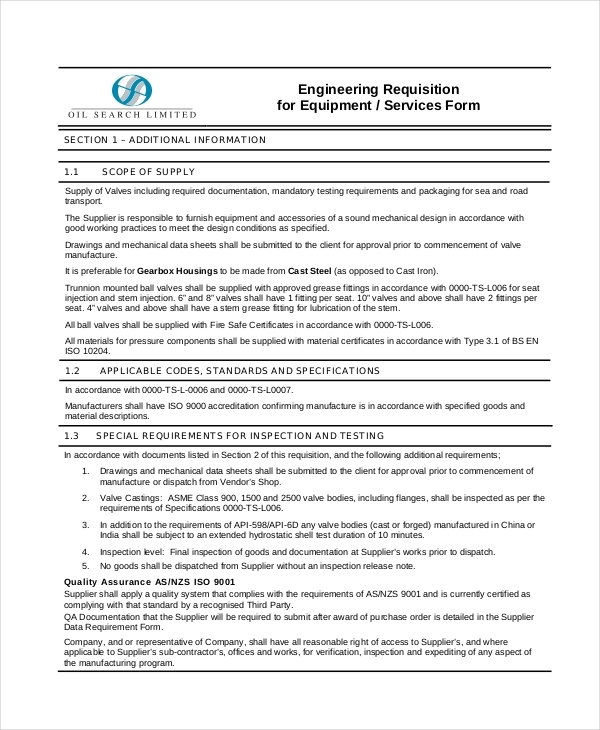 This form is used is get approval on buying of engineering goods. The various goods that are needed to purchase are mentioned in this particular form. The items and the quotations along with the price are also mentioned, so that there comes no such confusion regarding the buying process. Soon after the approval from the concerned department, the people start placing the order for the items. This form is also kept as record for future purpose. This document is used by the employees in relation with the various purchases that they need to make. The employees fill the form with every detail of the items that are needed to be purchased and then send it to the concerned department for the final approval. It is a very quick process of requisition- The process of requisition and then the approval of goods and services takes place in a much faster way with the help of this form. As all the details are mentioned in a proper way, it becomes easy for the concerned authority for approval to analyze it and give the order of purchase. It is the most legal and efficient way of getting purchase approval. This form is the only legal proof behind the process of placing request in buying the various goods and services that are needed in an organization. The form acts as a legal document and the concerned approval department keeps it for further use. Based on this form, the purchase order is sanctioned. A single document serving many purposes- The multi tasking work of this particular form is one of it’s biggest advantages. Every item or service that is needed can be noted down in this particular form for the final approval. This is completely hassle free and the process gets completed in a very easy manner. The target audience of this particular form is varied. All the people attached with an organization use this form in order to buy various goods and services. Therefore, mostly the employees under a company make the best use of this form. Whenever there is a need of buying certain items, the employees fill up this particular form and send it to the concerned department for the approval. The purchase requisition form is used for a single purpose and it makes the purpose absolutely fruitful. Any purchase that is needed to be made is filled up here for the approval by the concerned authority. All organizations, large or small, use this form in buying the various logistical items or some other things. A purchase requisition form is one such document which helps in requisition of any purchase made by any organization. This is a legal document which is used by the companies for the all the requisition purposes in buying goods and services.